The cost for the nation’s new air traffic control system could triple to $120 billion and require an additional decade to finish, the government’s top transportation watchdog told lawmakers this week. 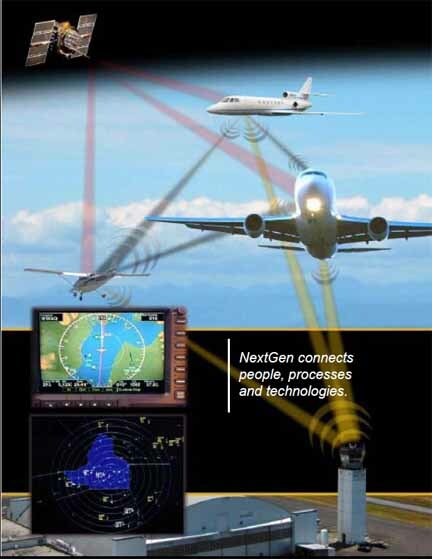 NextGen, the new Federal Aviation Administration (FAA) air traffic management system, replaces old ground-based air traffic control (ATC) infrastructure with satellite–based navigation and communications. Once complete it will enable planes to fly closer together and use more direct routes, saving time for passengers, reducing fuel costs for airlines and lessening the environmental impact of air travel. Widely considered essential to handling ballooning future growth in air traffic, the GNSS-supported NextGen system was supposed to be finished 11 years from now at a cost of roughly $40 billion, said Calvin Scovel, the Department of Transportation (DoT) Inspector General. Scovel said that $5 billion to $6 billion had been spent on NextGen over the last nine or 10 years and costs were set to climb. “We’re probably also looking at total expenditures on the magnitude two to three times that of the initial $40 billion,” he told committee members. “I think the consensus is we are a long way from where we want to be and thought we would be at this point in time,” Dillingham told Rep John Duncan, R-Tennessee, who wanted to know how much more money was needed. “When you build a building, when you build a giant skyscraper, at one point the building’s finished. Where are we on all this?” Duncan asked. “Progress has been slow and there is a realization now, more of a realization, that NextGen is a transition rather than a leap forward all at once,” said Dillingham, adding that the aviation community was getting frustrated with the slow progress. That lack of progress has been at the center of attempts to reset NextGen priorities to please air carriers who are seeing limited benefit from substantial investments in NextGen equipment. FAA Administrator Michael Huerta told lawmakers. Air carrier frustration may have reached a point, however, that changes will be necessary to keep the aviation community engaged, an element essential to NextGen’s success. Widely suggested has been the idea of splitting off the air traffic control role now handled by FAA and privatizing it, as has been done in other countries. “We’re hearing the community say ‘Maybe it’s time to look for a new way of doing this,’” said Dillingham, repeating a message he sent last fall during Aviation Week’s NextGen Ahead conference in Washington. Congress may be ready to make big changes, according to Capitol Hill staffers speaking at the same meeting. Bill Shuster, R-Pennsylvania, chairman of the House Transportation and Infrastructure committee and Rep. Frank A. LoBiondo, R-New Jersey, chairman of its Aviation Subcommittee, understand that we must modernize air traffic control, said Holly Woodruff Lyons, Republican staff director for the Aviation Subcommittee. But Scovel suggested that revamping the current approach now, when the FAA is so deep into the process, might not be the right idea.